The Papua New Guinea Hunters released their final 29-man squad for the 2018 Queensland Cup yesterday with 13 new faces set to feature for the defending premiers this season. The team to play the Brisbane Broncos in a preseason trial at the National Football Stadium on February 24 will be named today. The new faces are Baundo Aba (Enga Mioks), Illa Alu (Agmark Gurias), John Andy (Lae Tigers), Junior Bobby (Enga Mioks), Edene Gabbie (PRL), Brendon Gotuno (NCDC Vipers), Dilbert Isaac (Agmark Gurias), Patrick Morea (NCDC Vipers), Clyde Name (PRL), Junior Rau (Hela Wigmen), Charlie Simon (Lae Tigers), Julius Yakopa (Mendi Muruks) and Mckenzie Yei (Hela Wigmen). Foundation Hunter Adam Korave returns to the club after a two-year stint in the Ipswich rugby league competition. 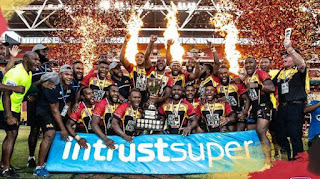 The South Pacific Brewery-sponsored side has had to draft in debutants after the turnover of five experienced players from the 2017 title winning squad. Forwards Henry Wan, Esau Siune, David Loko and Albert brothers Wellington and Stanton are no longer part of the club with coach Michael Marum bringing in Yei (Wigmen), Isaac (Gurias) and Alu (Gurias) to shore up his front-row stocks. Experienced duo Israel Eliab and Bland Abavu were not considered and will need to work their way back into contention from the Digicel Cup. 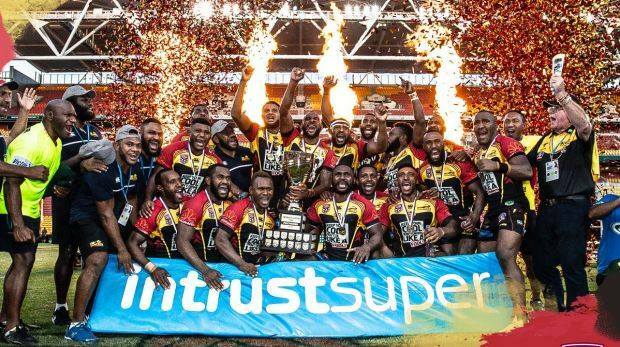 Marum said the players had signed their one-year contracts in Port Moresby on Sunday and were looking forward to defending the Intrust Super Cup title. Marum said the squad would be trimmed to 27 prior to the season opener against the Ipswich Jets on March 11 but he expected to most of the new faces cement spots after the Broncos match. Details of the match against the Broncos will be released by PNG Rugby Football League chairman Sandis Tsaka at the Sir John Guise Stadium today. Hunters squad: Baundo Aba, Junior Bobby (Mioks), Illa Alu, Dilbert Isaac (Gurias), Stargroth Amean, Ase Boas, Watson Boas, Rhadley Brawa, Gahuna Silas, Muka Peter Kulu, Enoch Maki, Moses Meninga, Willie Minoga, William Mone, Butler Morris, Wawa Paul, Wartovo Puara Jr, Nixon Put, Adex Wera (Hunters), John Andy, Charlie Simon (Tigers), Edene Gabbie, Clyde Name (PRL), Brendon Gotuno, Patrick Morea (Vipers), Adam Korave (Ipswich), Junior Rau, McKenzie Yei (Wigmen), Julius Yakopa (Muruks).